Custom made, hand engraved signet rings of gold and steel. Refined form meets exclusive design in Steel Signet rings. Choose from one of four elegant signet ring shapes — round, oval, soft-square or cushion (soft-rectangle) — cast in yellow or white gold. The signet ring top is stainless steel, impervious to wear, truly timeless. Each Steel Signet ring presents as a blank canvass for a custom engraving of your choosing — a family crest, coat of arms, monogram or custom artistic render — which is then hand carved by our master engraver and fused seamlessly with the ring. 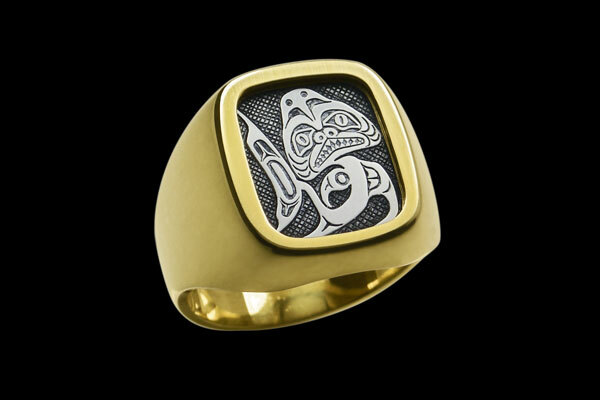 Designed by Warren Smith, artist and master hand-engraver at The Coast Handworks Co., the striking result is an entirely original, hand-crafted signet ring of pure beauty and unmatched durability. The steel tops will never tarnish, scuff, dull or wear out — guaranteed. These are signet rings with the longevity of generations; heirlooms everlasting. True Legacy Rings. Too big. Try a smaller file, please. Note: Uploaded image files will be used for reference only and replicated by hand on a stainless steel signet plate. You will see and approve the final design before it is committed to steel. If you do not have an image, we will discuss your ideas with you and help you design a custom peice. You will not be billed at this time. After submitting this form, we will contact you to confirm the details of your inquiry and supply a quote. You will be notified of a final price and billed only upon acceptance. Traditional heraldry carved in steel, framed and protected by elegant gold ring. Elaborate monogram, yellow gold round ring with stainless steel top. Custom designed monogram, yellow gold square ring with stainless steel top. Team logo, custom design, yellow gold square ring with stainless steel top. 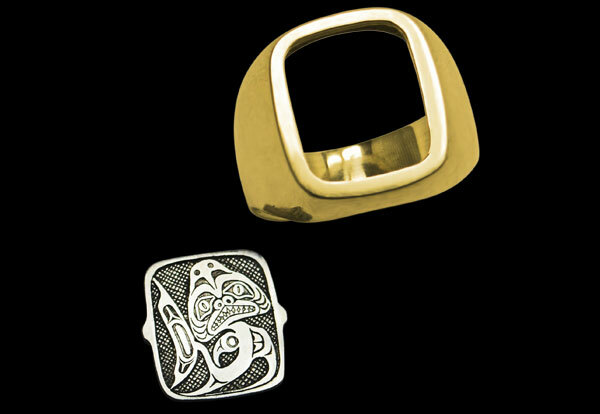 Northwest Coast Native art, Haida Dogfish, yellow gold cushion ring with stainless steel top. Elegant monogram, yellow gold oval ring with stainless steel top. Custom corporate milestone, company logo, yellow gold cushion ring with stainless steel top. Orignal art, stamped in silver from hand-carved master plate, inset in gold signet ring. Copyright © steelsignet.com | All rights reserved.